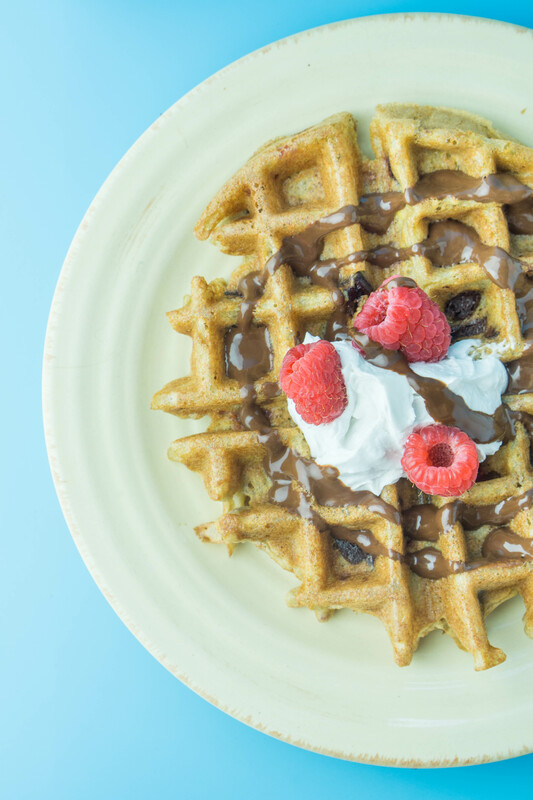 These delicious waffles are filled with ooey gooey chocolate and raspberry perfection! You won't want to try any other waffle recipe ever again. Be warned. 1. Preheat Belgian waffle iron. 2. In a large mixing bowl, whisk together flour, coconut sugar, baking powder, and salt. 3. Add almond milk and egg yolks. Whisk until just combined. 4. In an electric mixer or with a hand mixer, whip egg whites until stiff peaks form. Then, add to better. 5. Melt coconut oil, then add to batter and whisk to combine. 6. Add vanilla to batter and mix. 7. Add raspberries and dark chocolate chunks and stir gently. 8. Spray hot waffle iron with olive oil or coconut oil and set to medium heat. 9. Pour 1/2 cup batter into center of waffle iron and close. Cook according to your waffle iron's instructions. 10. Serve with coconut whipped cream and more raspberries. * If you want to eat waffles all at once, heat the oven to 200 degrees F before making waffles and line a baking sheet with parchment paper. Once each waffle is cooked, place on top of lined baking sheet until all are ready to be eaten. * For additional deliciousness and beautiful presentation, pour melted dark chocolate over each waffle.